of practicing my art, specifically color, daily. The artist On Kawara died in June 2014 at the age of 81,or at the age of 29,771 days. Starting in 1966, he created nearly three thousand “Date Paintings”. On Kawara’s concept and the show “Sol LeWitt: 100 Views” at MASS MoCA (2008 – 2033) influenced me to begin this series September 1st, 2014. From a Sherwin Williams paint store I take samples of three hues for the month. 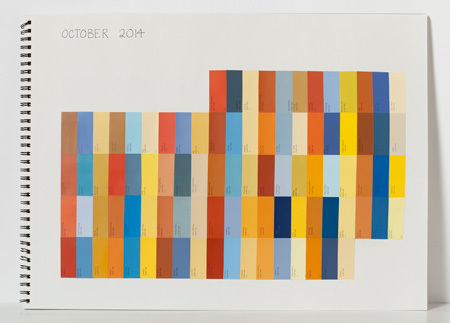 For example, October might be orange, blue, and yellow. There are more colors than I can use in the month, but this allows me a great variety as well as insuring no color will repeat. 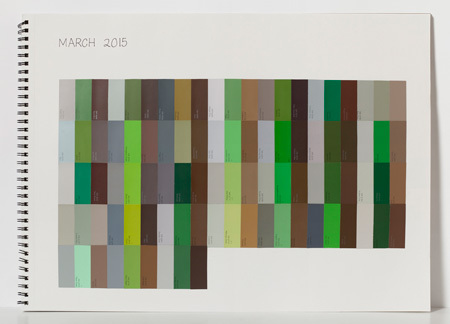 Each day I select a color from each hue and paste it onto a layout of the current month. The colors flank one another horizontally, but as the weeks progress, they connect vertically also. 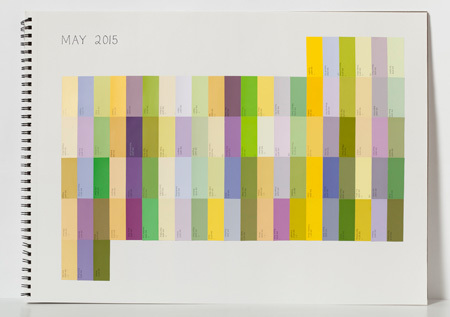 The color relationships merge and separate as the month advances. And each new month is a fresh start.